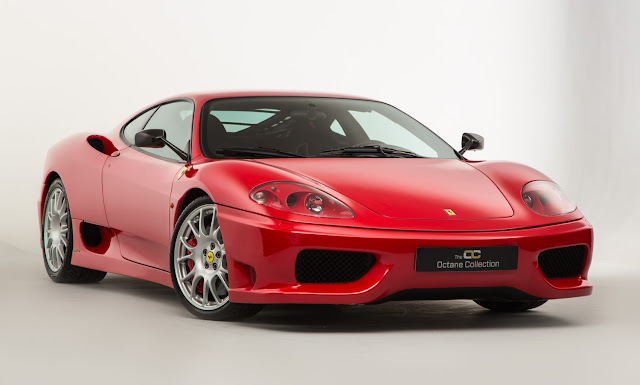 Based on the 360 Modena the Challenge Stradale was a limited production track day focused car that was used to homologate improvements to their GTC race car. Focus at Ferrari was to improve the Modena’s track lapping performance and took inspiration from the then current 360 Challenge race car by concentrating on handling, braking, weight reduction and aerodynamics essentials for any out and out racing car. Weighing in at just 20Kg more than the challenge race car and a huge 110Kg less than a standard Modena this resulted in a dramatic performance increase, add in ceramic brakes as standard taken directly from the Enzo, a 25bhp increase in power, aerodynamic improvements to the front bumper, side sills, rear engine lid and double rear end meant the Challenge Stradale lapped the Fiorano circuit 3.5 seconds faster than the Modena (the target for the Ferrari engineers was 2.5). Straight line power and performance figure only differ marginally from the standard Modena (three tenth faster to 62 mph) on paper which makes it difficult to comprehend the staggering difference between the two cars and it’s only when the enthusiastic driver takes to the controls does the Challenge Stradale deliver through its feedback and responsiveness. With a limited production run of sub 1300 cars worldwide combined with an incredible soundtrack and loyal fan following, the Challenge Stradale is an instant modern classic. Left hand drive, Alcantara lower dash, seats and dash, Red Calipers, Factory Harnesses, Tracker. This is a stunning and incredibly clean example of the 360 Challenge Stradale that is presented in classic ‘Rosso Corsa’ deep red paintwork. The aerodynamic Pininfarina-designed body is like new, unmarked and entirely free of blemishes having been in the care of just 2 careful owners. With distinctive low-slung, sweeping lines, twin rear headlights set into a punched black grill and two sets of twin exhaust pipes incorporated into the rear bumper it stands out as the track derived variant in the 360 line up. As with all Challenge Stradales, the bumpers and skirts are made from super-light resin, shaving weight and adding to the purposeful track focused stance. The stripped-down cockpit of the car is like new with a distinctive race car feel from the full lightweight alcantara interior and race harnesses. The carbon-fibre racing seats are completely unmarked as is the grey alcantara on the upper and lower half of the dash, reducing the overall weight of the car and adding to a classic race car colour scheme. The centrepiece of the carbon fibre instrument panel is a yellow tachometer, with speed to the right and vital engine indicators to the left. The carbon centre console houses the location for the starting button, reverse gear, launch control and ‘Race’ settings that adjust the throttle response, dampers, exhaust valve operation and gear change speed. The 360 Challenge Stradale’s V8 engine, longitudinally mounted behind the cabin, emits a distinctive throaty roar on starting, before settling into a more measured and reassuring grumble as the exhaust valve take control. Out on the road the exhaust note is one of Ferrari finest. Its six-speed gearbox uses the advanced F1-type electro-hydraulic manual system, allowing the driver to change gear with ease in either ‘Sport’ or ‘Race’ mode by flicking the paddles mounted on either side of the steering column. The last clutch wear measurement at 10k kms in 2014 showed just 7.5% wear. The immaculate 19″ BBS wheels are secured by titanium bolts and are held to the road with original equipment Pirelli P Zero Corsa low profile tyres, replaced in 2014 and having done just over 2k miles, they still have plenty of tread. A carbon-ceramic disc braking system from Italian manufacturer Brembo further reduces the overall weight, so improving handling and adding to the race car-like feel of the car. The original barcode stickers applied to the calipers when new are still present and show as new, combined with only 2% brake wear measured in 2014 show this car has only ever been used carefully and as a treasured item. Supplied from new by renowned Ferrari main dealer Rosso Corsa in Italy on 16/03/2004. This exceptional Stradale was owned by an Italian living and working in the Netherlands. It remained in his sole care until we sourced and purchased the car for its current and only UK owner in 2014 at approximately 10k kilometres. Current mileage is 8,297 miles or 13,353 kilometers and having just been serviced by Foskers inc cambelts, the car is on the button and ready to drive away. With just two owner from new, both of which have pampered the car, it is presented with the original leather owner’s pack containing all manuals and tourch plus all three alarm fobs and two sets of keys of which one set still remains in its original unopened bag. The car of course still has its indoor cover, an unused tool box and Ctek charger.